I suppose some of you might be wondering about this week’s Monday Morning Art. Well, first of all, it continues this month’s Halloween theme. Second, it is a digitally-composited photograph, combined with another, earlier digitally-composited photograph, to create a half-assed homage to a work by one Edgar Allen Poe. One of the photographs is a shot I took of the “Away With You” wall in Grantsville, Georgia, as immortalized in the “Clear” episode of The Walking Dead. 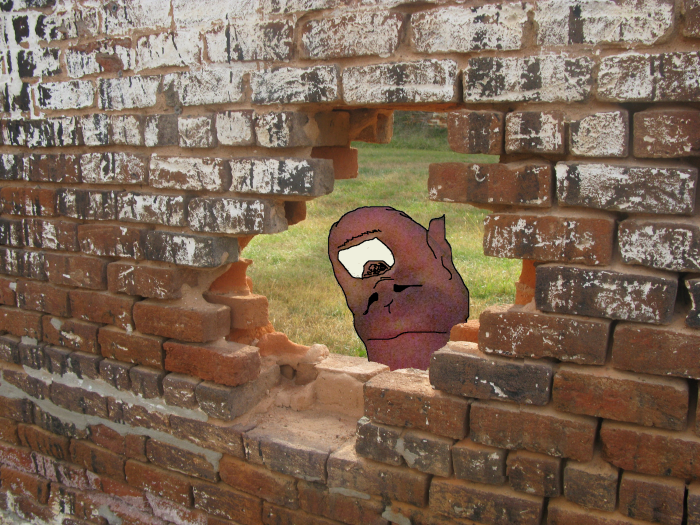 The wall, part of the ruins of a cotton gin, has holes like this in it, and looks really cool. Poking his head through the wall is The Toe Cyclops. It is highly unlikely that anybody will remember him, but he was part of “Monster Faces,” a bit of collaborative art by my brother and me that was an entry in the inaugural edition of ArtMares, way back when HallowEast was fun. As you can see to the right, the Toe Cyclops was the monster face in the lower-right corner. An interesting point of trivia is that the Toe Cyclops is actually a photograph of my big toe, which had taken on a purplish hue following one of the periodic dropping of something ridiculously heavy on my toes that tends to occur on a regular basis. I took a photo of it, and having nothing better to do, gave him an ear and a pupil, and made the toenail into the white of his eye. I mean, who wouldn’t think of that? I think it’s sufficiently spooky to work with this month’s theme. To be honest, it cracked me the hell up, especially with the particularly ignorant, yet literate, title I chose for it, so I decided to stick in here. Click the image to see a larger version. Well, the top image. 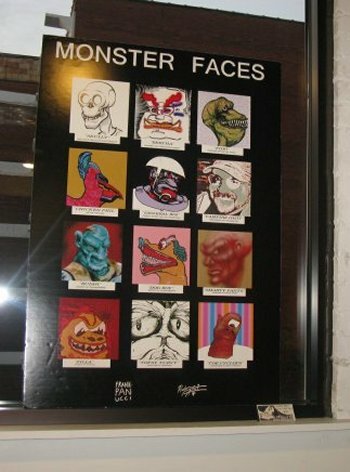 I don’t have a bigger image of the photo of Monster Faces, but I do still have the rather large piece, since nobody bought it. It’s hanging on the wall behind my front door. Meanwhile, today on The AIR, we present a 24-hour marathon of special Halloween programming. From 7 AM Monday until 7 AM Tuesday you can tune in to hear Halloween episodes of Radio Free Charleston, Sydney’s Big Electric Cat, Radio Coolsville, The Bats**t Crazy Show, Curtain Call and RFC International, all mixed in with classic Radio Drama and more spooky goodness. We’re going to do this again next Monday, and again, in a shorter form, on Halloween, so get used to it for the next couple of weeks.